Time flies and it feels like it was only yesterday that you didn’t have a care in the world and now all of a sudden you are researching minivans to tote around your growing family in. 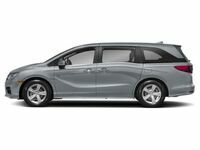 Thankfully for you there is the 2019 Honda Odyssey with its athletic exterior styling and lavish interior amenities, no longer will minivan owners be burdened by the unfounded stigma of minivan ownership. The advanced technology features found inside the 2019 Honda Odyssey will have you bragging to your friends about how cool your new Honda Odyssey is. 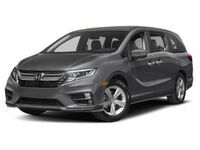 Get to know all of the engine specs and interior features for the 2019 Honda Odyssey below and you can find the 2019 Odyssey at Van’s Honda in Green Bay, WI waiting for you on the lot. 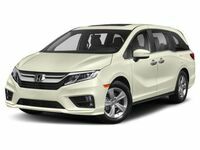 The standard engine of the 2019 Honda Odyssey is a 3.5L 24-Valve V6 engine that supplies the 2019 Odyssey with 280 horsepower and 262 lb-ft of torque. Pairing with a standard 9-Speed Automatic Transmission with Paddle Shifters and an Eco Assist™ System the 3.5L V6 engine arms the 2019 Odyssey with EPA fuel economy estimates of 19 MPG* in the city and 28 MPG* on the highway. A 10-Speed Automatic works with the 3.5L V6 on the Touring and Elite trim levels. The interior of the 2019 Honda Odyssey LX trim level has standard seating for seven people while the EX, EX-L, Touring, and Elite trim levels have seating for eight passengers. All trim levels of the 2019 Honda Odyssey have flexible rear seating that can expand on its standard 32.8 cubic feet of cargo volume. The LX and EX trim levels have a maximum of 144.9 cubic feet of cargo volume while the EX-L, Touring, and Elite trim levels have 140.7 cubic feet of cargo volume available. 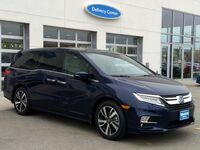 Other standard interior amenities of the 2019 Honda Odyssey include a 5” Color Touchscreen Display, Bluetooth® Connectivity, a 7-Speaker Stereo System, and Automatic Climate Control. 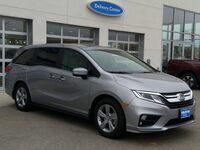 The 2019 Honda Odyssey EX-L trim level adds an 8” Color Touchscreen Display, Apple CarPlay™ & Android Auto™, an Auto-Dimming Rearview Mirror, and Tri-Zone Automatic Climate Control. Finally, the Elite trim level gets equipped with CabinTalk™ In-Car PA System, the Honda Satellite-Linked Navigation System, an Advanced Rear Entertainment System w/ Blu-Ray™ Player, and the HondaVAC®. 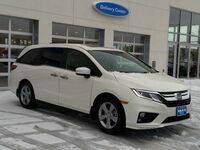 Take the 2019 Honda Odyssey for a test drive today at Van’s Honda in Green Bay.